For a century Harlem has been celebrated as the capital of black America, a thriving center of cultural achievement and political action. At a crucial moment in Harlem's history, as gentrification encroaches, the author untangles the myth and meaning of Harlem's legacy. Examining the epic Harlem of official history and the personal Harlem that begins at her front door, she introduces us to a wide variety of characters, past and present. At the heart of their stories, and her own, is the hope carried over many generations, hope that Harlem would be the ground from which blacks fully entered America's democracy. Sharifa Rhodes-Pitts, a native Texan who graduated from Harvard in 2000, moved to Harlem two years later to pursue professional opportunities in New York City. In 2004 she wrote an article about her experiences living there, and was encouraged to write this book, which is named after a 1948 essay by Ralph Ellison about the psychological and existential aspects of life in Harlem. Rhodes-Pitts introduces us to several of her older neighbors, who have experienced the dramatic changes of this now resurgent section of Manhattan that counts Bill Clinton and other whites as new residents. Despite these recent changes, a culture of respect and camaraderie, based on mores of African Americans who migrated to New York from the Jim Crow South decades ago, still exists. We also learn about past residents of Harlem, including familiar ones such as Langston Hughes, Zora Neale Hurston, Marcus Garvey and Adam Clayton Powell, Jr., and less well known but no less important figures, including George Young, whose bookstore was known as the "Mecca of Literature Pertaining to Colored People", and Victoria Earle Matthews, the founder of the White Rose Home, which aided female emigrants establish a foothold and learn basic skills necessary to survive in a metropolis that existed beyond the imagination of the daughters of slaves and sharecroppers. The book is divided into thematic chapters, which include the literature of Harlem, the neighborhood as a place of refuge, written signs and messages with overt and hidden meanings, and past and current efforts to keep the neighborhood from becoming gentrified or unduly commercialized. The book ends with the author's observation of the African American Day Parade in Harlem, which serves as a celebration of life in the neighborhood but also as an account of the tension and stress that exists there, as peaceful residents are caught between hostile city police officers and young men who seek an outlet for their passions and frustrations. If Harlem could speak, this book would be its memoir. Harlem has been home to generations of African Americans going back to the late nineteenth century, and it's the heart of Black America's rich and vast literary, political, economic, and cultural life. In recent years, Harlem has been the focus of real estate developers and cynical politics seeking to cash in on Harlem's growing attraction for upper-middle-class whites, while forcing out the very long-time residents whose struggles and persistence helped give Harlem its rough magic. What makes Harlem Is Nowhere so enchanting is that the author reveals Harlem to us as she is discovering it herself – indeed, she moved to Harlem in 2002 in order to write the book. The opening chapter is about her neighbors, in her building and on the block she lives on. The process of getting to know the people she sees every day is like a choreography that is best understood after one passes through it, and it's fascinating to see it unfolding. In subsequent chapters, Rhodes-Pitts examines Harlem's literary and artistic riches, both past and present. When she writes about writers and activists like Ralph Ellison, Langston Hughes, James Baldwin, Zora Neale Hurston, Marcus Garvey, W.E.B. DuBois, Adam Clayton Powell, Jr., and many more who are not as well known, the reader is right there with her as she conducts her researches at the Schomburg Center for Research in Black Culture and chats up interesting characters on the streets that she explores every day. The author's powers of literary criticism and her political and social insights are formidable, but at the same time there is a transparency to her discoveries and observations. It's clear that this author's passion for her subject is as much personal as it is academic. 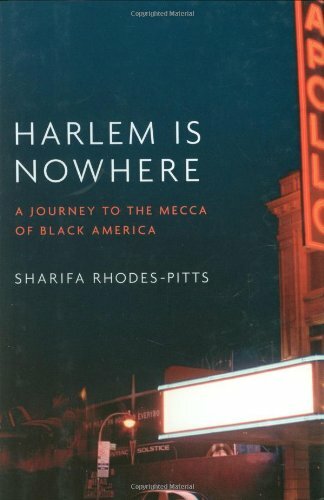 Sharifa Rhodes-Pitts has written a tribute to Harlem that she can be proud of and gives much to the rest of us to think about. Arriving in Harlem when gentrification was well on its way to changing the face of this once thriving "mecca" of black american culture, Rhodes-Pitts is, in turn, resident, neighbour, scholar, friend, political voice, masterful storyteller. In her regular walk from her front stoop to the Schomburg Center for Research in Black Culture where she is gathering material for this book, we see what and who she sees, we stop when she does, listen in on her conversations, and pick up new tidbits of information along the way. For instance, it was a great surprise to me to learn that the point of departure for Toni Morrison's novel, "Jazz", can be found in James VanDerZee's "The Harlem Book of the Dead". Seeing that this book was one of those that I was "saving" in my TBR pile, I wanted it to be extraordinary and worth the wait. I was disappointed. I really wanted this book to ooze with all the Harlem goodies I imagined. There was no ooze. "I don't remember a thrill that was specific to being in Harlem. The thrill was in the library. Harlem was the place I rushed past to meet it. The library was my true destination." From Rhodes-Pitts we get present day Harlem with some of the past sprinkled throughout. She makes seamless shifts between the past and the present. She compliments a current event with one from the past. There is a certain eloquence to the presentation but yet this eloquence is enveloped in boredom. Rhodes-Pitts is a Texas transplant to Harlem who really doesn't allow the city to seduce her. She seems to purposely stand on the side lines and observe with very little engagement. Once people found out Ms. Rhodes-Pitts was a writer they either opened up to her or totally objected to their stories being written. The ones that gave their stories and were forth coming with their history of Harlem were stirring and reflective. One could not help but be touched by the story of Ms. Minnie Davis and all the neighbors that lived in Ms. Rhodes-Pitts building. It is clear that Rhodes-Pitts is most comfortable in the library doing research on Harlem past. My favorite chapter and the one I found the most golden nuggets in was, "Into the City of Refuge." My entire perspective on Ralph Ellison changed after reading this chapter. Of course there were the "expected" mentions and thoughts on Langston Hughes, James Baldwin, and others of the Harlem Renaissance but Rhodes-Pitts didn't dwell on the familiar people and places she dug out the obscure. The insight and background given on Arturo Schomburg and how he built his collection which was in turn turned into one of the most well known centers for African-American research made the entire book worth reading. Though it took me a while to get through this book I'm glad I did. It's a very personal and richly written history of Harlem, including a lot of very personal insights from the author. She gives the reader insight not just into the straight up history of the area but also the people, the art, the music, everything.